Specifications: Please check your measurements to make sure the item fits before ordering. Use similar clothing to compare with the size. S: Shoulder: 18.4" -- Sleeve: 25.0" -- Chest: 42.9" -- Center Back Length: 28.9" M: Shoulder: 18.9" -- Sleeve: 25.2" -- Chest: 44.9" -- Center Back Length: 29.5" L: Shoulder: 19.6" -- Sleeve: 25.5" -- Chest: 47.9"-- Center Back Length: 30.1" XL: Shoulder: 20.3" -- Sleeve: 25.8" -- Chest: 50.9" --Center Back Length: 30.7" XXL: Shoulder: 21.0" -- Sleeve: 26.1" -- Chest: 53.9" -- Center Back Length: 31.3"
Coofandy fashion long sleeve t-shirts are not just appealing for spring and summer from a style standpoint-it lightweight, air-out structure makes it essential for survival. Super soft cotton always keep you cool in the heat. Solid color and casual fit, easily match with your jeans, chinos, denims and even swim shorts. Designed for every adventure, our ultimate classic shirt for men are perfect for wearing in the tropical heat on your island escape. Buy a ticket and pack your suitcase with Coofandy's casual T-shirt, go and enjoy the leisure time! 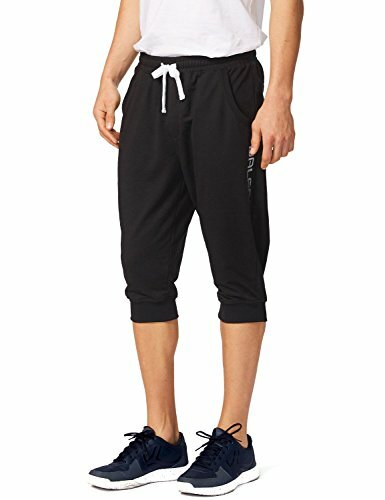 Naviskin Men's 3/4 Workout Training Jogger Capri Pants Athletic Gym Running Shorts Zipper Pockets Appear! Our new running workout training jogger capri pants combine fashion, function and performance, and offer the coverage you need for running, workout or daily casual wear, deliver a relaxed fit for all-day comfort! - Feature lightweight, sweat-wicking fabric to help keep you comfortable and moving freely. - Idea for running, marathon, jogging, training, gym, fitness, etc. 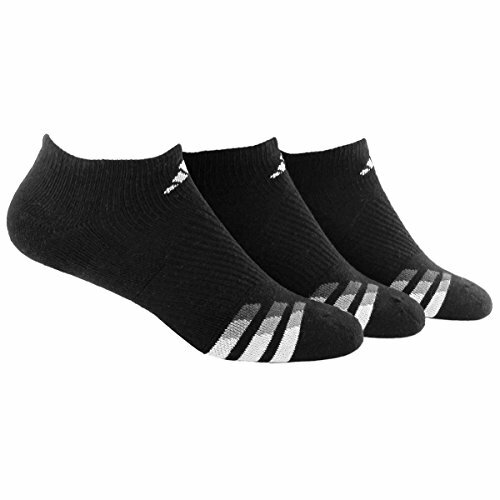 Tapered fit & ribbed cuffs, perfect for running, marathon, jogging, training, gym, fitness, etc. 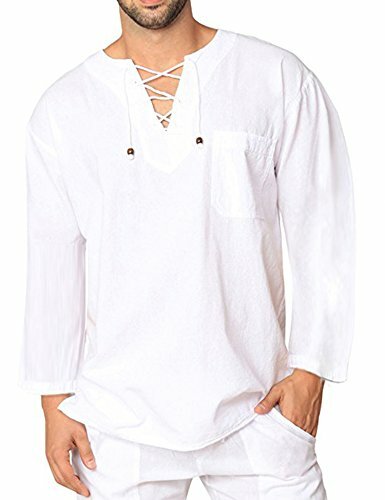 CandyHusky Casual elastic waist Loose-Fitting baggy Pants free your body to perform at its very best, no matter what activity you're engaged in. Whether it's downward facing dog in yoga class, forward lunges while working-out, or relaxing on the couch, these roomy pants deliver unprecedented freedom of movement. 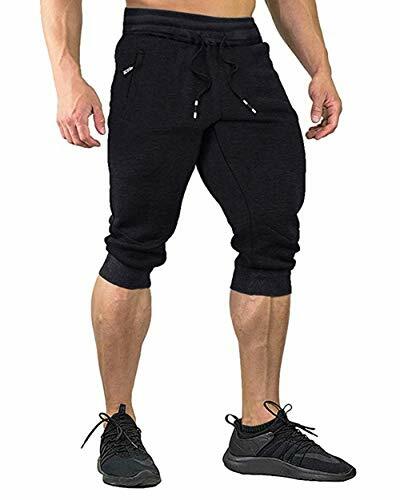 The elasticated waistband makes them suitable for a wide range durable enough for yoga or workouts, sport, lounge pants men, hip-hop pants, zumba dance workout clothes, joggers pants for men and women, running pants, baggy pants, tai-chi pants, exercise and fitness. You can wear this pants around the house and outdoor, they could be the most comfortable pants ever made. These are the most adaptive pants for men and women leading active and fulfilling lives. Lightweight 100% Cotton, high-quality material & nice cutting .Good for warm weather. Very breezy and comfy feel. Size S fit for 22-34 inch waist, total length 39.0 inch, inseam 29.0 inch, thight 27.0 inch, maximum hip 44.0 inch, 2 pockets. Size M/L fit for 24-40 inch waist, total length 40.0 inch, inseam 30.0 inch, thight 28.0 inch, maximum hip 50.0 inch, 2 pockets. Size XL/XXL fit for waist 30-46 inch, Total length 42.0 inch, Inseam 32.0 inch, Thigh 30.0 inch, Maximum hip 54.0 inch, 2 pockets. Size 3XL/4XL fit for waist 34-50 inch, Total length 44.0 inch, Inseam 32.0 inch, Thigh 32.0 inch, Maximum hip 56.0 inch, 2 pockets. Hand wash or delicate cycle on your machine is preferred. use of cold water is recommended. Hot water may cause cotton item to shrink. 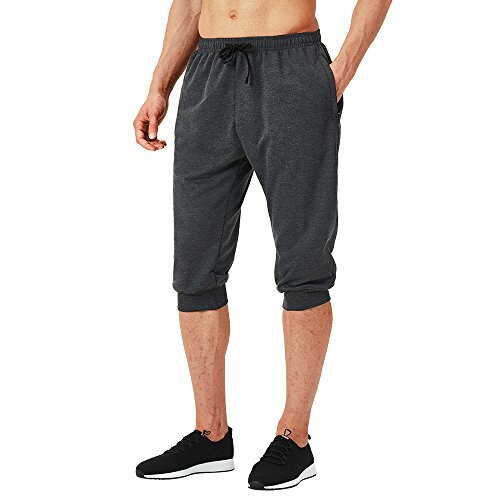 STYLISH CASUAL PANTS FOR WORKOUTS & RELAXING - These high quality mens jogger and lounge pants with elastic waist offer the ultimate in style, comfort and versatility for an unbeatable price. 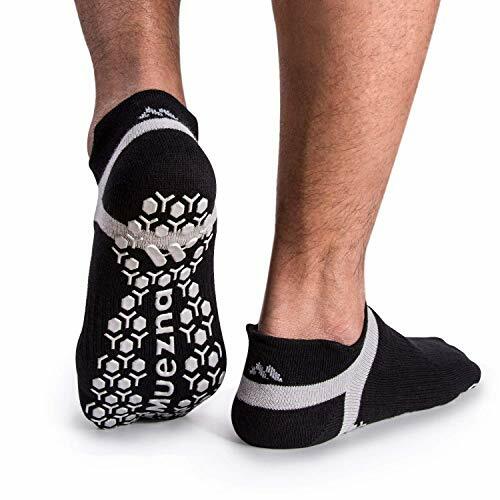 They come in 8 trendy colors, including white and black, and keep you comfortable and cool when relaxing at home or working out. 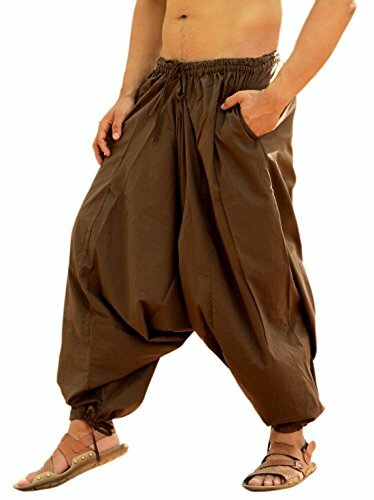 FLEXIBLE & VERSATILE FOR MODERN MEN - These wide leg casual pants with hand side pockets are specially designed and made for busy men (and women!) who need a flexible and comfortable clothing solution that can work for yoga, pilates, the beach, the gym, a dance class, or as pajama bottoms. MADE FROM SUPER SOFT 100% COTTON - At CandyHusky, we make our customers' comfort a priority, which is why our men's drawstring pants are made from the finest quality cotton fabric that is lightweight, breathable, and super soft on your skin. They're also machine washable and they dry super quick! EASY CARE in your washing machine on the cold setting keeps colors vibrant and ensures long-lasting durability. Wear CandyHusky Loose Fit Yoga and Workout Pants in place of traditional, clingy sweat pants for travel, sleeping, lounging and activities that call for unrestricted movement. Lululemon made these shorts to keep us feeling comfortable and cool from training days to race day. A continuous drawcord is easy to cinch mid-stride so we can streak past our personal records. Get up and get it!...All purpose light weight shorts. Great for running, walking, hiking, biking and just about everything. Great for just hanging around the house too! Preshrunk and moisture wicking Swift Ultra is both comfortable and flattering. Measurements: 2.5" inseam, Size 2 Waist: 27" Size 4 Waist: 28" Size 6 Waist: 29" Size 8 Waist: 30" Size 10 Waist: 31" Size 12 Waist: 32" Stretches another 1 inch more. 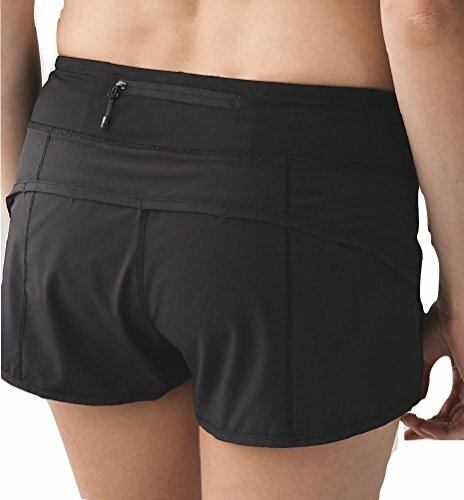 Lululemon made these shorts to keep us feeling comfortable and cool from training days to race day. A continuous drawcord is easy to cinch mid-stride so we can streak past our personal records. Get up and get it! Swift Ultra fabric is sweat-wicking and four-way stretch. Smooth fabric waistband lies flat under your top and has added LYCRA fibre for great shape retention. Three-pocket waistband gives you plenty of storage options - secure your keys and cards in the back zipper pocket, and pack your gels in the two waistband pouches. Swift Ultra. 86% Polyester, 14% Elastane. Inseam: 2.5 inches. RUNS SMALL - PLEASE CONSIDER SIZING UP. This Gaiam Yoga Socks is guaranteed authentic. It's crafted with Cotton/Nylon/Polyester/Rubber/Spandex. 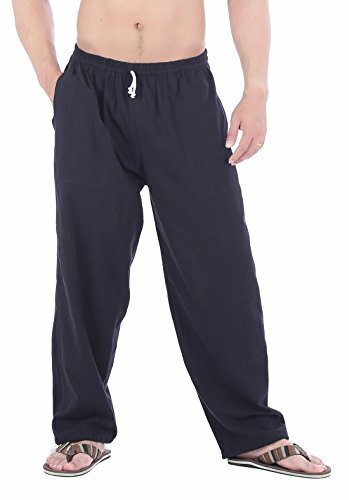 Comfortable Elastic with Drawstring Fitted Waistband, FREE SIZE FITS TO ALL (up to 46 Inches Waist), Minimum Waist Size : 28 Inches, Maximum Waist Size : approx 46 Inches, Length : 40 Inches, Material : 100% Cotton, Ankles: Drawstring Fitted Ankles, Pockets : 2 Side Pockets, Washing Instruction : Gentle wash separately in cold water. Washing Instruction : Gentle Wash Separately in Cold Water. These are Unisex Pants so can be wearable by Men, Boys, Women, Girls. 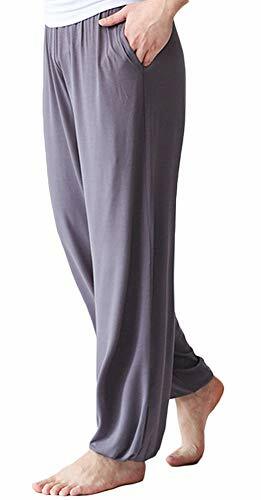 Comfortable Elastic with Drawstring Fitted Waist, Drawstring Fitted Ankles. Useful for Yoga, Casual Wear, Beach Wear, Dance etc. Material: 95% modal cotton + 5% spandex. Loose fit design, elastic soft waist band, comfortable stretch fabric. Offers no pocket or with two side pockets options. Perfect for indoor or outdoor exercise, jogging, yoga, home wear, etc. Recommend hand/gentel machine wash cold, do not bleach.